Unpaid Internships: Burden or Benefit? Unpaid internships have been taking a lot of heat lately. Unpaid internships are supposed to be purely for the benefit of the intern, they cannot displace current employees, and the company cannot profit from their work. However, interns at Fox Searchlight felt these rules were being violated and took it upon themselves to do something about it. Last week a judge ruled that Fox Searchlight should have paid two interns because they were being used as regular employees. A win for the interns! Before you get any ideas about suing your own company, keep in mind that most unpaid internships are, in fact, legal. Most unpaid internships are offered by nonprofit organizations, though some are beginning to pay interns minimum wage to protect themselves from any legal ramifications. Internships are supposed to provide professional experience and prepare students for careers after graduation. However, The Atlantic notes that unpaid internships may not be the best preparation for the job market. They reported that a study by the National Association of Colleges and Employers found that recent graduates who had paid internships were significantly more likely to graduate with job offers than those with unpaid internships. Granted, paid internships are more competitive and are often designed to turn into fulltime jobs, while unpaid internships often are not. 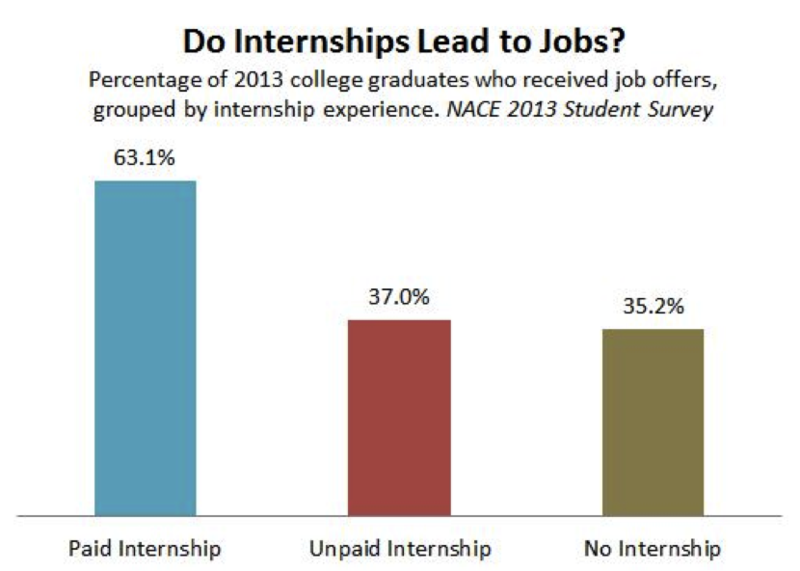 However, this finding is still noteworthy since there is such a difference between paid and unpaid internships, and not much difference between unpaid internships vs. no internship at all. Another criticism of unpaid internships is that they exclude lower economic classes of students. Many students rely on summer jobs in order to support themselves throughout the following school year and buy textbooks. While in college, I took an unpaid internship one summer and it was definitely tougher getting through the following year with fewer funds. Students fortunate enough to receive financial support from their family can easily take an unpaid internship to garnish their resume. Many cannot though, and graduate with less professional experience and fewer job options. In the wake of the recent court ruling, it will be interesting to see how companies respond and if they change their internship policies. I personally believe that unpaid internships are unfair because many students cannot afford to work for free throughout the summer, and trying to take on a second part time job can be overwhelming. Companies should at the very least provide a small stipend to their interns to cover transportation costs and meals. Tags: college, College Students, economy, Fox Searchlight, Fulltime Jobs, Internships, National Association of Colleges and Employers, Student, The Atlantic, Unpaid Internships. Bookmark the permalink. Previous post ← The Government is Making Money Off Students; Is that a Good Thing?